Test the Language Guesthouse online and see for yourself our teaching quality! 4 lessons free! Get them here! The ideal combination: Study online with us and take an immersion training once a year at the LG! Get fluent in German soon! 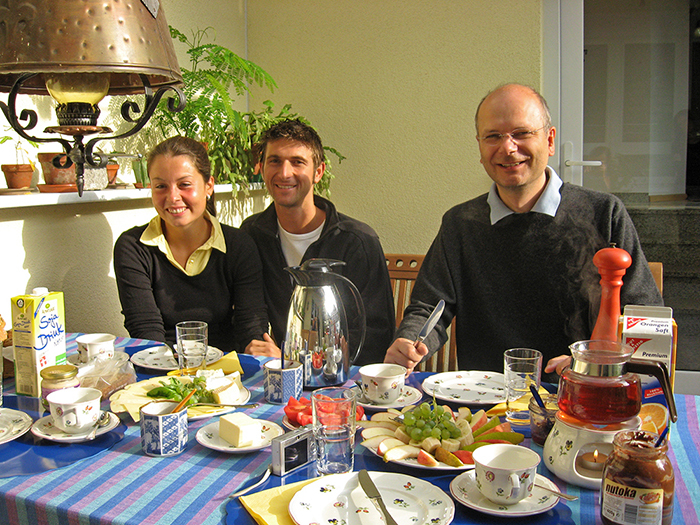 My Bed+Breakfast guests appreciate the tasty and rich breakfast at the Language Guesthouse. In Summer breakfast is served on our mediterranean balcony. Here you enjoy the morning sun and start each day of your holidays in a good temper. 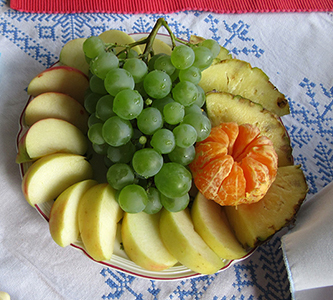 - In the cold season, you'll have breakfast inside with no loss of taste. Would you like to taste? - Please, help yourself! ...on your journey, for a short trip or a longer stay in one of the most beautiful regions of Germany? You'll find it at the Language Guesthouse! You're welcome - whether you're travelling alone, with your partner, with your family or with a group of friends, whether you come from Germany, from any country in Europe or from the opposite side of the globe. By the way, I speak German, English, some Russian and a tiny little bit French. And what else will you find at the Language Guesthouse? Instead of the anonymity in a hotel you'll find a warm welcome and a personal ambience of hospitality. So you will feel immediately "at home" with us. 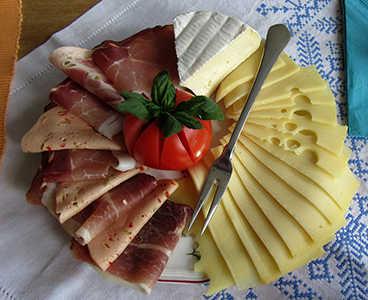 Individual tips and recommendations for your stay in the region of Kaiserstuhl and the further surroundings. The opportunity to find new German and international contacts among guests of the Language Guesthouse. If you're studying the German language or if you would like to do so: I offer you a free trial lesson during your stay! And you will discover your creative talent, if you want! Just have a look at Creative Holidays! You'd like to come for a stay? Then please send us your inquiry of dates via , Fax (+49-7662-226759, phone (+49-7662-936880) or the following contact form. 3 cozy bedrooms (1 single/ 1 double/ 1 double or triple) for a total of 6 guests are available at the Language Guesthouse. It goes without saying that a rich and healthy breakfast is part of our service - and if you like, also a tasty dinner, home-cooked of fresh ingredients for you. 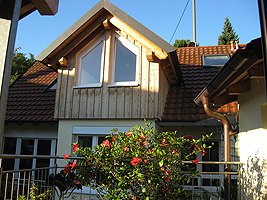 Since March 2010 a holiday apartment at the Language Guesthouse is available as an alternative accommodation for language students or vacationers. This apartment is particularly suited for those couples or families, who prefer to cook themselves and attach importance never to share their bathroom with other guests. The description of the holiday apartment is to be found at the menu "Accommodation". 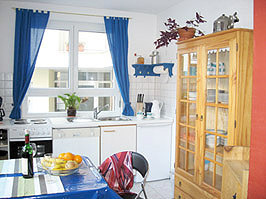 You'd like to book the apartment for your language stay, your creative holiday or just for recreation? Then please send us your inquiry of dates via , Fax (+49-7662-226759, phone (+49-7662-936880) or the following contact form. 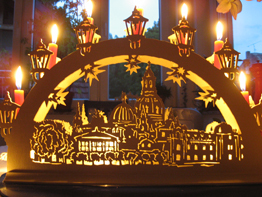 Under careful guidance you learn how to make aesthetic and decorative wooden items using traditional motives from the Ore Mountains (Erzgebirge): Table mats, candleholders, window hangings, lanterns, and the well known German candle arches and Christmas pyramids - the programme will be extended by and by. Crafts are made of plywood using a mechanical fret saw and variegated in colours with acrylic paint. The fretsaw technique is a wonderful and creative hobby, which provides a wide range of creative possibilities for beginners and masters, for people with cautious and courageous disposition. The figuration of very simple shapes is possible likewise the crafting of delicate preciosities. Chances are that this captivating hobby won't release you any more after you have tasted blood. Reservation of single nights is possible earliest 3 weeks before your arrival date! Cleaning fee f. single night stay. ** Dinner usually is composed of soup or salad/ main dish/ dessert. All rates are shown including bed linen, towels and cleaning. All rates are shown including bed linen, towels, tea towels and final cleaning. *Some of the activities require extra charge for material (purchased items).